This sweet Peppa Pig Birthday Party would be quite the highlight for any lucky little birthday girl! 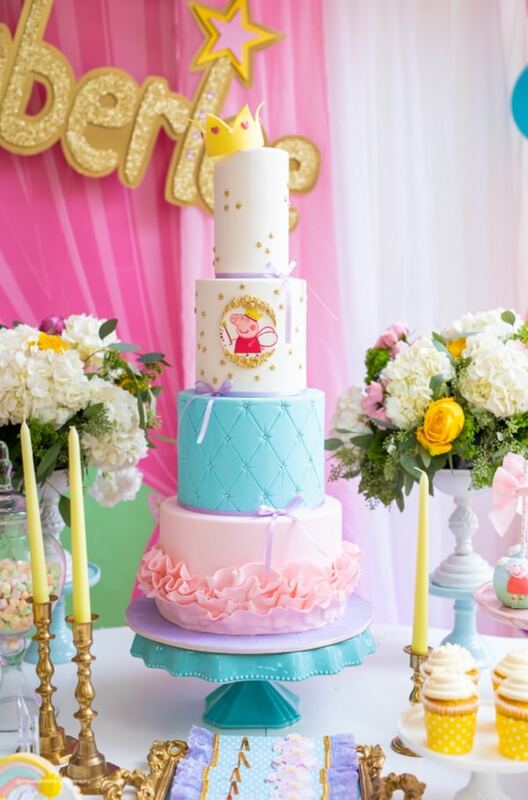 We just love all of the exquisite details that are a part of this Peppa Pig themed party! A Peppa Pig Birthday Party is what this little girl wanted for her birthday and it was exactly what she got! What an incredible backdrop! It was certainly a highlight of this Peppa Pig Birthday. Absolutely everything was meticulously planned and it all came together perfectly, thanks to quality vendors who were all on the same page. We love it! 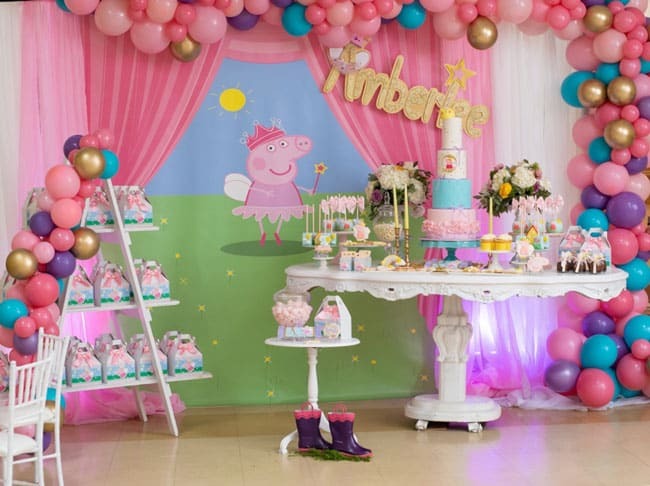 KettyDelights did an incredible job when it came to the event planning and decor for this special Peppa Pig Birthday Party. There was no detail left undone and when it came to overseeing all of the Peppa Pig Party Decorations, no stone was left unturned. 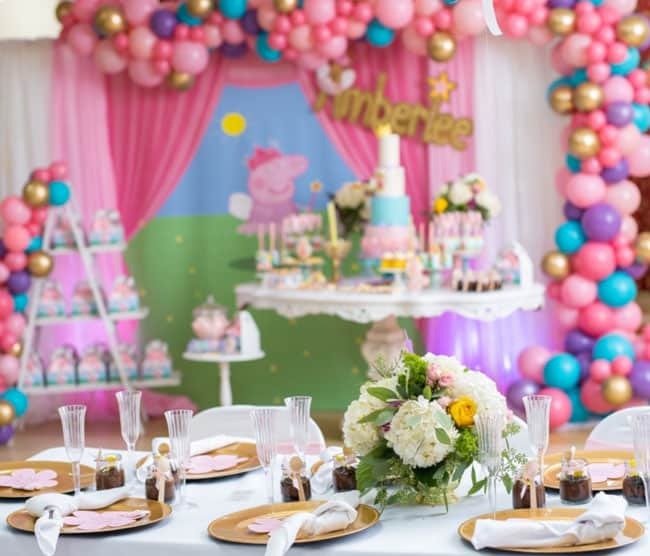 It is an incredible Peppa Pig Birthday Theme, that started with this amazing Peppa Pig backdrop from The Design Shoppe By Sie! 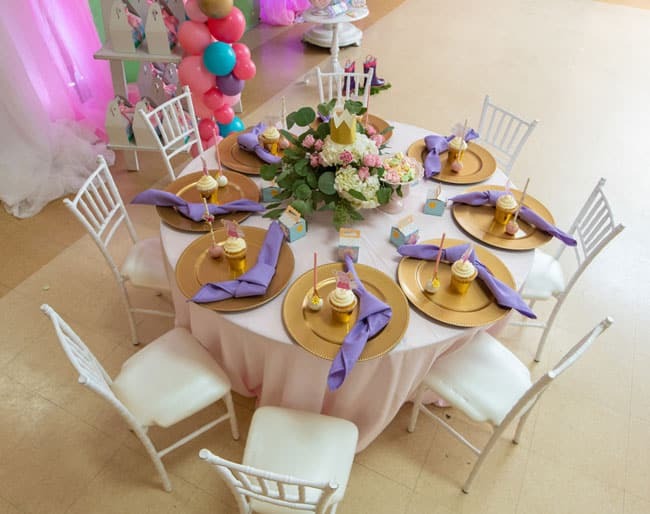 We can only imagine all of the party guests’ excitement when they walked into this fun venue! The personalized name, created by HC By Alexandra, was another great highlight of the backdrop, which the birthday girl just loved. Who wouldn’t want to see their name up high at the event, in gorgeous gold, no less! All of the Peppa Pig Party Decorations were absolutely on-point! So many of the Peppa Pig Birthday Ideas were absolutely outstanding, including the table settings that were used for all of the guests. We love the gold chargers, that were contrasted with the purple napkins. 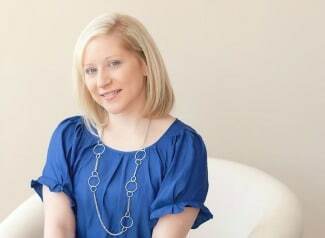 Everything was so elegant and a little girl’s birthday dream! 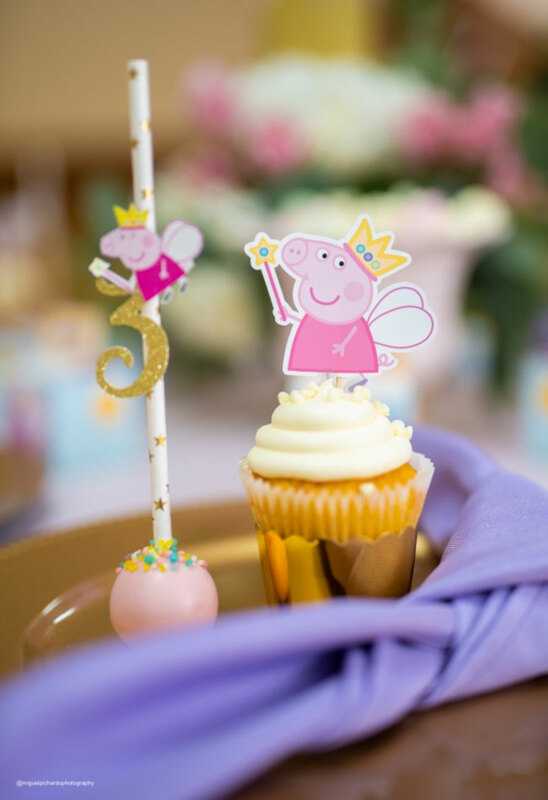 Who wouldn’t love showing up at a Peppa Pig Birthday Party, just to find the most delicious cupcakes on your plate, ever! What a great way to set the tone for the entire birthday. It’s Peppa Pig Party Ideas like that that made the event so successful! All of the birthday girl’s guests were able to admire the amazing dessert table, highlighted by the Peppa Pig backdrop that was used. 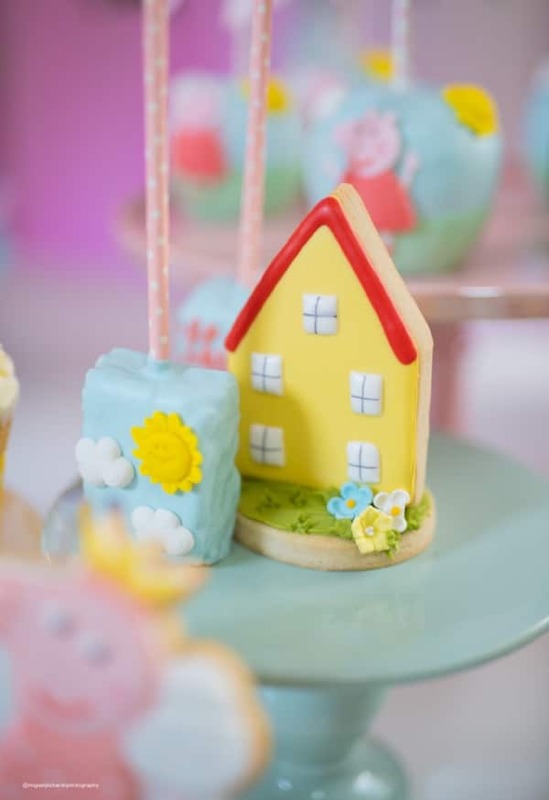 We’re surprised that any of the Peppa Pig Birthday Party guests were able to stay attentive to what was going on around them when they knew they were going to be able to dig in to all of those delicious desserts later in the day! 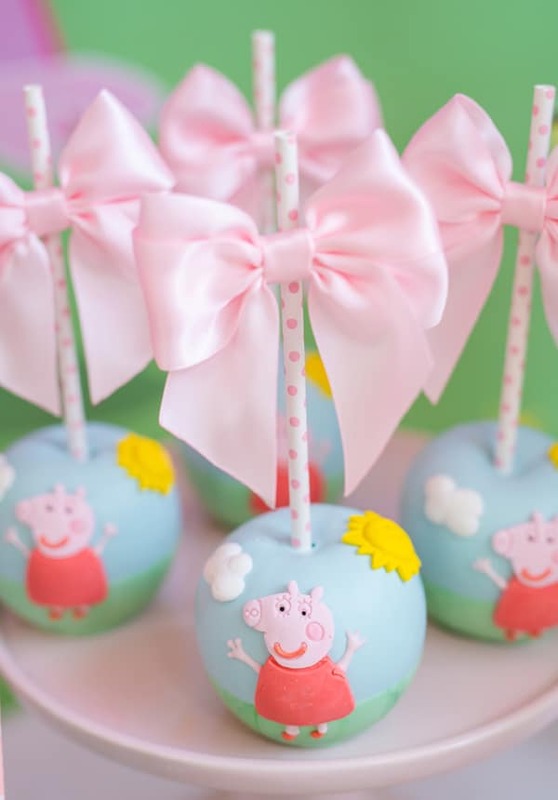 These might be the most adorable Peppa Pig cake pops we’ve ever seen! from.mireyas.kitchen went out of their way to make the best cake pops for any themed party and these Peppa Pig themed ones definitely did not disappoint. We also love the additional detail-oriented items, like the polka-dot pink stick, topped with an adorable pink bow. Mayra’s Cake Pops also created many of the sweets that were found around the Peppa Pig themed party, as well. Look at these delicious-looking cupcakes that were part of the dessert table items. They look so yummy and the sweet Peppa Pig cupcake topper was the perfect addition to the perfect dessert treats! How amazing are these detailed cookies that were found on the dessert table at the Peppa Pig Birthday?! There were so many delicious desserts that were available, including the cookies and chocolate covered Rice Krispie treats that were decorated special for the Peppa Pig Birthday Theme! 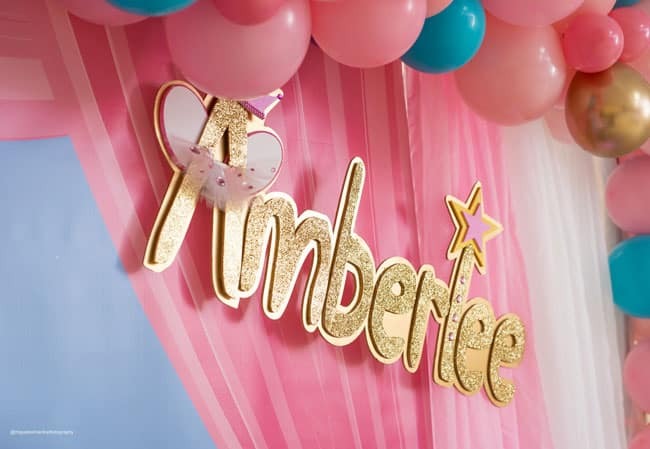 Everything was fun, airy and bright for a little girl’s birthday dream party. Who wouldn’t love this?! Additional Peppa Pig Cookies were available with the birthday girl’s age represented on a handful of the cookie designs. 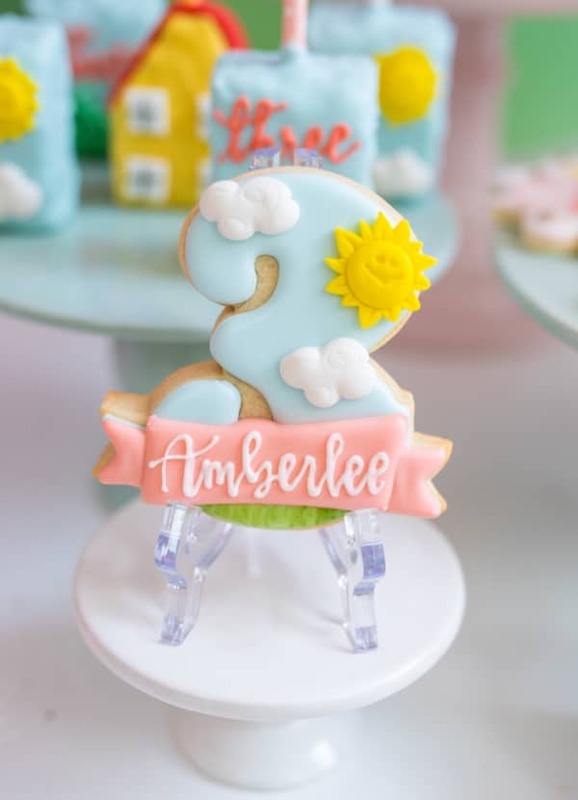 These are quite possibly the best birthday cookies we’ve ever seen decorated for a Peppa Pig loving birthday girl, who was turning 3! What detail, precision and work-of-art for every cookie that was created. We would want to keep one, just to keep looking at it for days to come for a reminder of the special day! These little chocolate cake cups might be the most creative way to serve delicious cake ever! We love how the disposable spoons are tied right to the individual-sized servings. 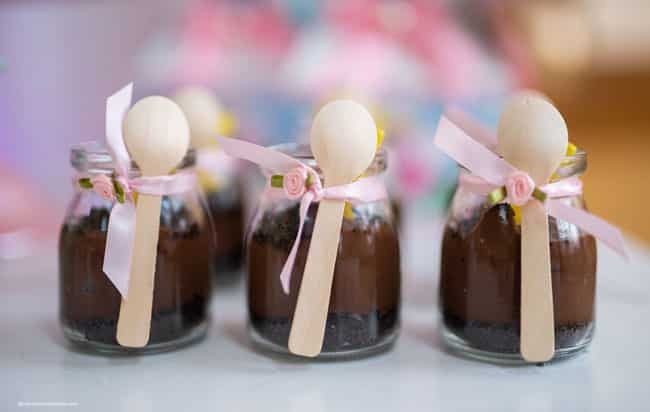 And with chocolate cake and chocolate pudding as the main ingredient in the cups, we’re sure that they went flying off the table when all of the guests were finally allowed to dig into the dessert table! Yum! There Should Always Be Cake created the most amazing Peppa Pig Birthday Cake that was possible. Just look at this multi-tiered, gorgeous creation! We’re betting that the birthday girl squealed with glee when she got a look at her special birthday cake. Who wouldn’t want to have this at their Peppa Pig Birthday Party?! It almost looks too amazing to cut up and serve! Of course, doily lined personalized chocolate bars were available for all of the guests, as well! Even if they weren’t hungry, they were great additional party favors for everyone to take home, as a memento of the amazing Peppa Pig Birthday Party that they were invited to! How cute are the sweet Peppa Pigs that were attached to every chocolate bar?! 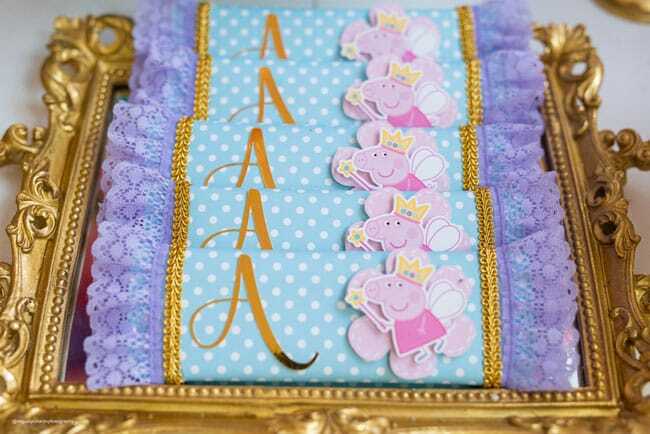 All of the Peppa Pig Party Favors, created by Imagine Creations, couldn’t have been set-up in any cuter fashion! 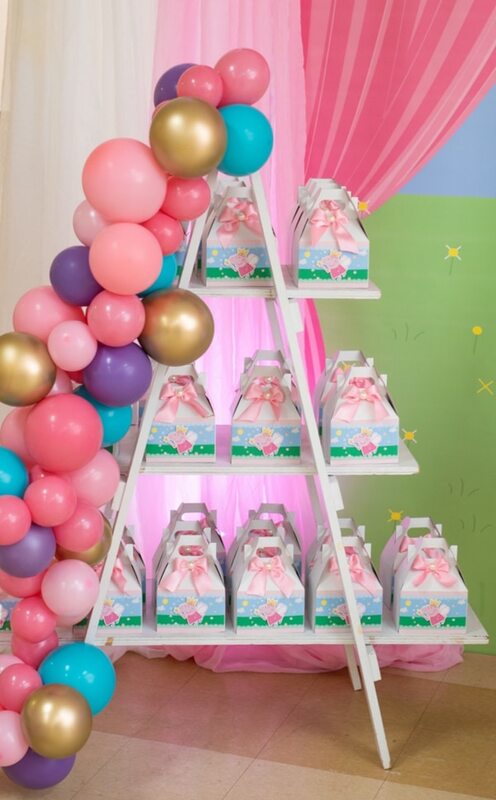 We love the ladder concept, with all of the party favor boxes lining up the levels. What a great way to display the amazing Peppa Pig Party Bags that all of the little guests got to take home, while making sure they weren’t forgotten. And of course, there are more gorgeous balloons styling up the ladder, as well! The icing on the cake? 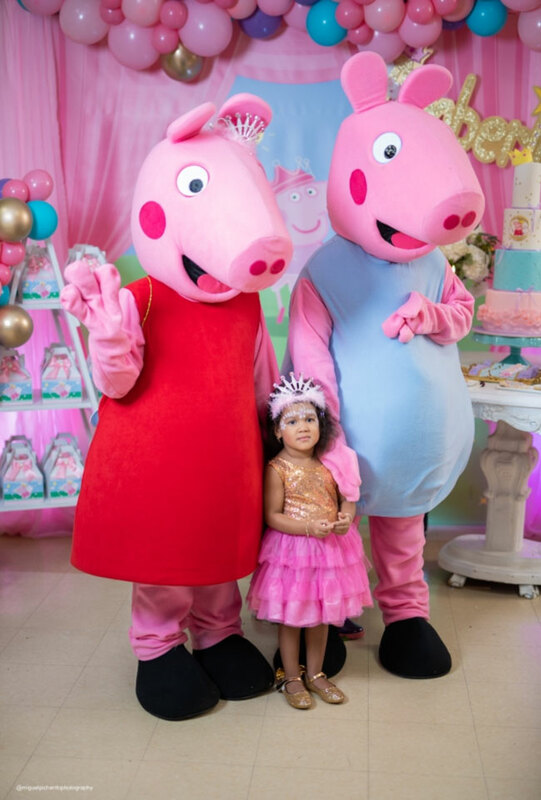 Peppa and George made a special appearance for the big day and the birthday girl couldn’t wait to get her picture taken with them! Talk about a great way to end the perfect party for this sweet girl. 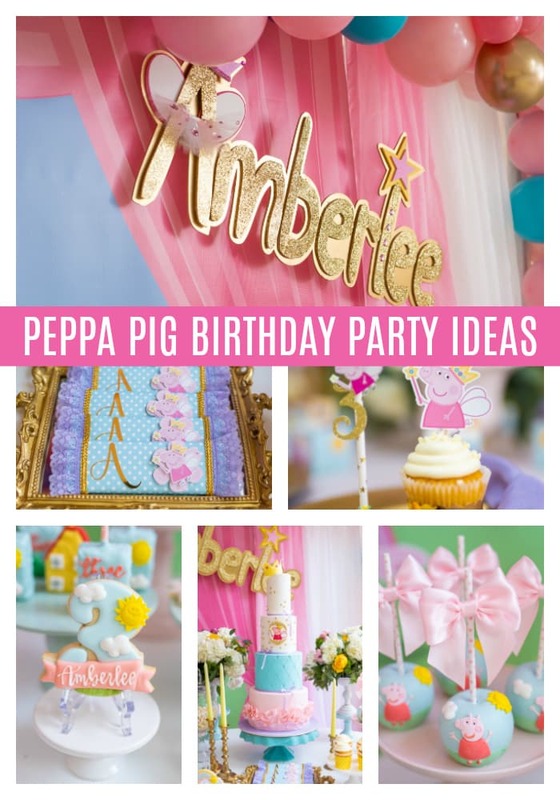 If you have Peppa Pig Party Ideas on the brain, this party will inspire you with many great ideas for your own Peppa Pig Birthday Party! Enjoy!